One of the arrangements of the sale of Maserati to industrialist Omar Orsi in 1937 was that the Maserati brothers would continue to work for the company for another ten years. The brothers honoured the agreement and continued to work for the factory until 1947 when they left to start a new company of their own; OSCA. Orsi was on his own, but the Maseratis had left a newly designed straight six engine. Although it was planned to be used in motor racing, it would first find its way into Maserati's first Grand Tourer. Orsi understood very well that building just racing cars was not going to be enough to keep the company afloat, so he ordered his engineers to construct a road car. This would by no means be a mass production car, but rather a very exclusive sports car. Dubbed A6, the new Maserati debuted at the 1947 Geneva Motorshow equipped with a Pinin Farina designed body. Under the skin a 1.5 litre, single overhead camshaft engine was mounted in conjunction with a 4-speed gearbox. Producing just 65 bhp, the new engine was not a very good performer. The chassis was a simple steel tubular frame with two side members and a number of cross members. Front suspension was by wishbones, coil springs and Houdaille shocks absorbers. At the rear a live axle was sprung and damped in a similar fashion. The poor performance, high price and bland styling did not make the A6 coupe a very big seller. Orsi took the lessons learned to heart and introduced a second version of the A6 at the 1951 Paris Motorshow in three different guises. The displacement was increased to 2 litres, which hiked the power output to 100 bhp for the optional three-Carburetor engine. Reminiscent of the great custom coach building tradition of the 1930s the new A6G was introduced with as a Frua Spider, a Vignale Coupe and a Pinin Farina Berlina. This latter coupe design would become the 'standard' body for the A6G, but it was not quite as elegant as the Pinin Farina designs of the years to come. For the same reasons as mentioned earlier and the introduction of the Ferrari 166 Inter, the 2 litre A6 was again not a sales success and only 16 examples were completed. 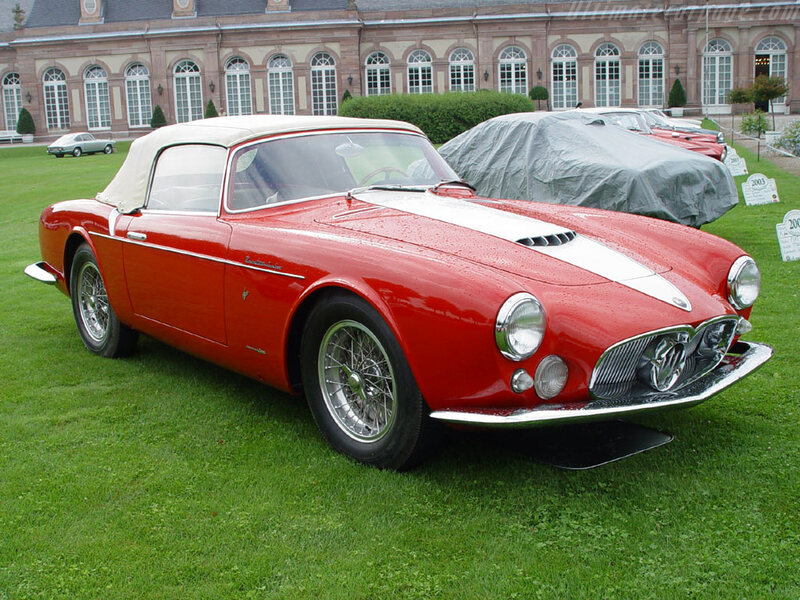 Maserati finally got it right in 1954 when a third evolution of the six cylinder road car was introduced. Commonly referred to as the A6G/54, it was equipped with a completely revised engine, which now featured twin camshafts and plugs. This engine was directly derived from the Maserati single seater and sports racers and produced a more competitive 150 bhp. Another great help was the availability of much better looking bodies from Frua and Zagato. Especially the lightweight Zagato bodies were commercial and aesthetic success. Production lasted for three years and 63 cars with a wide variety of body styles. It was replaced by the 3500 GT, which was more or less a production car, ending a decade of custom Maserati Grand Tourers.